Johnson Controls recognized for marketing, sales and customer support excellence. 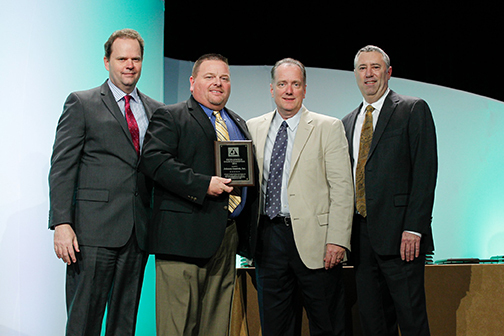 Johnstone Supply presents company with two awards at its 2014 Spring Sales Planning Meeting in Nashville. Johnstone Supply, a leading distributor in the heating, ventilation, air-conditioning and refrigeration (HVACR) industry, recognized Johnson Controls with two awards at its 2014 Spring Sales Planning Meeting and tradeshow in Nashville, Tenn. Receiving the awards on behalf of Johnson Controls were Ron Sevart, regional products distribution manager, NW Region (second from left) and Tim Brusseau, unitary products group distribution account manager (third from left). Representing Johnstone Supply were DeWight Wallace, chief executive officer (left), and Steve Porter, vice president, product development (right). Johnson Controls HVAC leadership and Coleman® brand were recognized by receiving two of the four supplier awards presented at the event – the Johnstone Supply Award for Excellence in Sales and Marketing and the Johnstone Supply Corporate Liaison Award. The Corporate Liaison Award highlights the individual contribution of Tim Brusseau, Johnson Controls Unitary Products Group strategic distribution account manager, for helping Johnstone Supply achieve its 2013 business goals. Both awards acknowledge Johnson Controls’ commitment to providing its customers with a broad product offering, robust training programs and focused sales support. According to Johnstone Supply, this commitment contributed to a 30 percent increase in sales for the distributor. HVAC products from Johnson Controls, marketed under the well-known Coleman® brand, include highly reliable residential central air conditioners, heat pumps, furnaces and accessories and light-commercial, packaged heating and cooling systems marketed through a network of distributors and delivered to home- and building-owners through independent Coleman heating and air conditioning dealers. For more information about Coleman HVAC systems, visit www.colemanhvacdealer.com. As an international leader in the innovation and marketing of outdoor products, The Coleman Company, Inc. helps people have fun and make memories by providing the gear integral to their favorite outdoor experiences. The company’s products include its legendary lanterns and stoves, as well as coolers, tents, sleeping bags, airbeds, backpacks, furniture, and grills under the Coleman® brand. Additionally, the company provides flotation devices, towables, rainwear, waders, hunting and fishing gear as well as safety and survival equipment under its Stearns®, Sevylor®, Sospenders®, Hodgman®, Mad Dog Gear®, and Helium® brands. Founded in 1900 and based in Wichita, Kan., Coleman is a wholly owned subsidiary of Jarden Corporation and can be found online at COLEMAN.com.